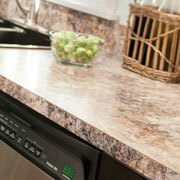 When updating a kitchen, turn to ProSource® of Mobile for ideas, guidance, products and service. Browse our displays and vignettes for cabinets, cabinet hardware, countertops, faucet and sinks. Kitchens are a place to prepare a meal, dine with family, entertain guests and provide storage. Even with all those needs, a kitchen renovation can be a space with charm and appeal, especially with the premiere team you’ll find at ProSource. Kitchen cabinets do more than add storage to a kitchen. They accent and personalize the entire space. Cabinetry comes in wood types such as oak, birch, cherry, maple, or metallic options like aluminum and stainless steel. 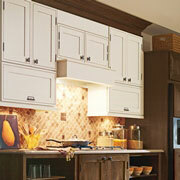 With the sizes and shapes to choose from, cabinets make a statement in the kitchen. 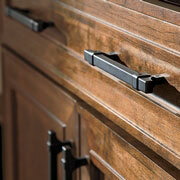 Cabinet hardware completes the style and design of the cabinets. Whether the desire is for knobs, handles, or pulls, in just about any color or finish imaginable, the hardware adds a subtle flair to the kitchen cabinets. Kitchen counters are heavily used, but they also add visible appeal to the space. Luckily there are a plethora of color options from solid to mixed, in varying materials ranging from granite to quartz to recycled materials and even blended raw materials. 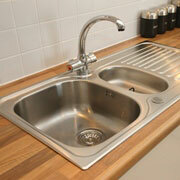 A kitchen sink does more than hold dishes until their washed; it can pull together the other elements in the room. As such, the functionality of the sink has equal importance to it style and look. Choose an apron, trough or standard sink, with one to three basins, in several available materials, giving the entire kitchen remodel a cohesive appearance. 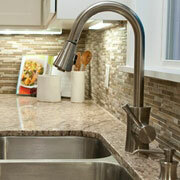 Choose a slick and sleek faucet or a fabulous and functional style for the kitchen sink. At ProSource, you’ll find an exceptional assortment from the industry’s top brands. Select from numerous types encompassing beverage, handles, pot-filler, pull-down, pull-out, or standard. We proudly serve Spanish Fort, Springhill, Mobile, Fairhope, and Gulf Shores, Alabama. The ProSource of Mobile showroom is conveniently located in Mobile, Alabama and serves all of the neighboring cities including Axis, Bay Minette, Bayou La Batre, Bon Secour, Bucks, Chunchula, Citronelle, Coden, Creola, Daphne, Dauphin Island, Eight Mile, Elberta, Fairhope, Foley, Grand Bay, Gulf Shores, Irvington, Lillian, Little River, Loxley, Magnolia Springs, Mobile, Montrose, Mount Vernon, Orange Beach, Perdido, Point Clear, Robertsdale, Saint Elmo, Saraland, Satsuma, Seminole, Semmes, Silverhill, Spanish Fort, Stapleton, Stockton, Summerdale, Theodore and Wilmer.